Every patient with stage IV non-squamous lung cancer should be tested. Many oncologists advocate for broader testing. Traditionally, all testing is done on a piece of cancer—a biopsy or surgical specimen. However, mutations can also be tested on tumor-derived DNA found in blood. Regardless of whether cancer DNA is obtained from tumor or from blood, there are different ways that it can be tested in the lab. Traditionally, the doctor ordered testing individually for each mutation he or she was interested in. Many centers are moving towards a method called next generation sequencing which would test for all of the above mutations in one test. Your tumor may have been tested with your initial biopsy. However, if not enough tissue was collected molecular testing can be done at any time. In many situations, patients with known mutations whose cancer grows on targeted therapy can benefit from being tested again. Most major medical centers often offer molecular testing. Talk to your doctor to discuss getting tested. Every living thing is made up of building blocks called cells. Inside of each cell is a set of instructions for how to do its job. These instructions are called DNA and mistakes in them are called mutations. Mutations can be inherited (rarely in lung cancer), occur due to carcinogens (cancer-causing chemicals such as those found in cigarette smoke) or through bad luck. Regardless, they can cause the cell to forget how to do its job and instead learn how to make copies of itself, spread and grow. A cell with such mutations is called a cancer cell. They work better: Response rate is arbitrarily defined as 30% shrinkage of cancer (it needed to be set somewhere to allow drugs to be compared to each other, but a patient with 29% shrinkage of cancer and a patient with 31% shrinkage of cancer really derive similar benefit, even if one is labeled as having “partial response” and the other as, “stable disease”). The response rate with targeted therapies is usually about 66% and most of the remaining 1/3 of patients derive benefit less than 30% shrinkage. They also tend to control cancer longer than chemotherapy. They’re less toxic: Targeted therapies are not side effect or risk free. But, they do tend to have a lot fewer side effects than chemotherapy. Side effects vary by agent, but rash and diarrhea are particularly common with these agents. They’re more convenient: While most chemotherapy is IV, most targeted therapies are oral. EGFR is present in about 15% of adenocarcinoma. Guidelines say that any patient with adenocarcinoma should be tested for EGFR, but statistically, the mutation is more common in nonsmokers, women and Asians. There are three classes of drugs that treat EGFR-mutated lung cancer: 1st generation tyrosine kinase inhibitors, 2nd generation tyrosine kinase inhibitors, and 3rd generation tyrosine kinase inhibitors. The FDA-approved first generation inhibitors are erlotinib and gefitinib. Their major side effects are diarrhea and an acne-like rash. Gilotrif (afatinib) is the only FDA approved 2nd generation tyrosine inhibitor. Osimertinib is the only FDA-approved 3rd generation inhibitor. PFS (time until cancer growth or death) is about 10 months on the first generation agents and about 19 months with the third generation agent osimertinib when used as first anticancer therapy. Osimertinib is also approved when cancer progresses on a first or second generation inhibitor and the mechanism of resistance is a specific secondary mutation called T790M. EML4/ALK is a rearranged gene that is found in about 4% of adenocarcinoma of the lung. The development of ALK inhibitors for patients whose cancer is driven by this change is inspiring; it was the fastest time from scientific discovery of target to FDA-approved drug ever. FDA approved drugs include the first generation agent crizotinib and the second-generation agents ceritinib and alectinib. Crizotinib was proven to control cancer longer than chemotherapy and both ceritinib and alectinib were subsequently shown to control cancer longer than crizotinib. Other new agents such as brigatinib and lorlatinib have shown clinical efficacy but are not currently approved. ROS1 is another rearranged gene with a lot of biologic similarity to ALK. It is present in about 4% of adenocarcinoma of the lung and is treatable with the targeted therapy crizotinib (same one as for ALK). Multiple new ROS1-targeted agents are in clinical trials. Both high level amplification of MET (duplication of the DNA instructions) and a specific mutation called MET del 14 can drive adenocarcinoma of the lung. Both are actionable with crizotinib (off label) and other MET inhibitors are in development. RET is gene re-arrangement driving about 2% of adenocarcinoma of the lung and also present in a number of other cancers. Two major agents are actively being studied in clinical trials with promising early data. There are many kinds of BRAF mutations. About half are V600E and these are the ones that are actionable with targeted therapy. Single-agent BRAF inhibitors (vemurafenib, dabrafenib) are active but double-inhibition with the combination of a BRAF inhibitor and a MEK inhibitor works better (dabrafenib plus trametinib). 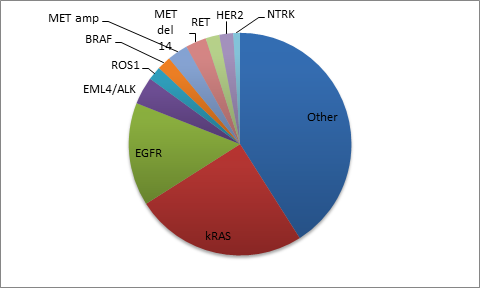 kRAS has been known to be mutated in human cancers since about the dawn of the internet, yet we still have no effective kRAS directed therapies. A lot of things have been tried; some even seem to be active, but as of now, none preferentially for kRAS. This remains an active are of investigation. (Information provided by Board Member, Jared Weiss, MD).